Many developed nations have already embarked on planning-led risk-based disaster management approaches. Nepal should learn from this and develop appropriate planning guidance considering its own climate, geography and socio-economic condition. An Aberdeen-based water scientist has gained himself a readership of more than 300,000 people across Asia and the world. However Sohan Ghimire, who works at the James Hutton Institute, is not a fiction writer on the bestseller list but has been passing on his expertise to help tackle floods in his native Nepal. As a guest columnist for the Kathmandu Post and its electronic version, ekantipur.com, Ghimire has been providing practical advice on how to face the challenges brought about by periodic flooding in Nepal, which is a by-product of climate change. In his first article, Ghimire discussed the concept of ecosystem services and how to tackle problems such as a growing population, poverty, habitat loss and degradation of crop genetic diversity, while protecting the country’s rich biodiversity. In his second column, he looked at the importance of forward planning to overcome flood risk, emphasising the importance of better awareness, education and development planning. 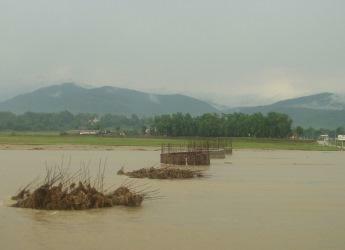 Last June and July, heavy monsoon rains caused the worst flooding to hit Western Nepal in a decade. The Mahakali River, one of the country's largest rivers, destroyed housing, infrastructure and thousands of hectares of agricultural land in Darchula district. The worst flooding in the region killed at least 50 people and affected as many as 60,000 villagers in 13 districts. Amid the trail of destruction left by floodwaters, Ghimire is hopeful that good planning and best practice can help Nepal avoid future repetition of the disastrous scenes this year. He says understanding the cause and the scale of impacts and wider consequences of such high-profile disaster events is essential, so that repetition of similar disasters can be prevented. “Many developed nations have already embarked on planning-led risk-based disaster management approaches and have already achieved positive outcomes,” he said. “The UK, for example, has adopted the principles of a risk-based approach especially to combat extreme flood disasters. There is strong planning guidance under implementation with a view to avoiding inappropriate developments within the natural floodplain of rivers. In the future, he aims to help educate the planners and the local people about the impacts of climate change on the occurrence of natural disasters like landslides and floods.